Starring Anna Kendrick, Rebel Wilson, Hailee Steinfeld, Brittany Snow, Anna Camp, John Lithgow, DJ Khaled, Hana Mae Lee, Ruby Rose, Alexis Knapp, Chrissie Fit, Ester Dean, Shelley Regner, Kelley Jakle, Matt Lanter, Guy Burnet, Alexis Knapp, Jessica Chaffin, Michael Rose, Andy Allo, Venzelia Joy, Moises Arias, Hannah Fairlight, Troy Ian Hall, John Michael Higgins, and Elizabeth Banks. Breaking away from a formula to do something different is all well and good, especially considering that we are on Pitch Perfect 3, but taking a franchise about a cappella singing competitions and turning it into spy espionage (someone get masterful video game director Hideo Kojima on the line and throw out the idea for Metal Gear Fat Amy) featuring dirtbag criminal fathers isn’t the right direction. Technically, The Fast and the Furious did the same thing when it ran out of mileage and found success, but here the results aren’t so positive. Rebel Wilson utilizes her wonderful comedic skills and timing trying to make it work, but it’s all just doomed from the moment the genre switches. In a questionable creative decision, Pitch Perfect 3 announces right away that the proceedings are about to shift away from a cappella shenanigans so that it’s not too out of left field when it happens, but that doesn’t stop the situation from feeling any less bizarre. At the same time, the film (directed by Step Up All In helmer Trish Sie and written by series regular Kay Cannon and Mike White who recently worked on stickers such as The Emoji Movie and Beatriz at Dinner) also has the habit of repeating jokes, sometimes entire sequences, from the first two. The characters even go on to acknowledge this fact with a one-liner that doesn’t really elicit laughter, and draws, even more, attention to these flaws. Of course, there is also the unnecessary pressure to put in more licensed mainstream song covers than ever before, getting to the point where the movie becomes more about recognizing songs rather than finding entertainment in how they service the story or group rivalries. 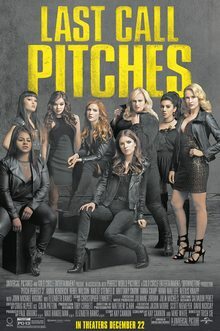 Somewhere in between this structural disaster of a narrative, Pitch Perfect 3 also wants to act as the finale to the trilogy, sending up the Bellas away from a cappella and into the next chapter of their lives. This was also sort of what the second movie centered on, as previously mentioned, this third entry is about doing the same old song and dance one more time while tacking on a random hostage situation. John Lithgow’s role in all this truly out of place and flat-out bad. Hopefully, the pitches take the film’s lesson to heart this time because a fourth movie would most likely be an even larger failure. A back to basics approach is desperately needed if (or not introducing new rival opponents only to drop the characters completely halfway through) the filmmakers do wish to continue; focus on the music and inserting it creatively. I already don’t remember 80% of the music licensed here. 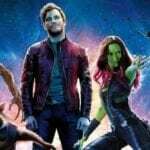 As was a complaint with the sequel, the cast of characters is far too crowded now resulting in an experience that leaves audiences caring about two characters, and maybe not even that much. Anna Kendrick and Rebel Wilson once again receive the majority of the screen time which isn’t necessarily bad, but there are so many other members of the group getting involved in subplots that get roughly 2 minutes of movie. At least openly offensive and misogynistic broadcast journalist John (John Michael Higgins) along with his partner Gail (Elizabeth Banks) return to film a documentary on the falling out of popularity performers as they make for some of the film’s funniest jokes yet again, but it really isn’t worth getting everyone together one last time for mediocrity. 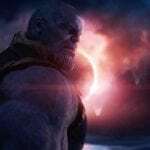 The opening moments are filled with amateurish dialogue explaining reasons behind failed relationships that developed in the last installment among other things, poorly justifying the third’s existence. Thankfully, Pitch Perfect 3 is mercifully short as it goes through the motions. Aside from that, it is occasionally funny (the girls find themselves tasked with impressing DJ Khaled who plays himself running the USO show they want to perform at) and it’s easy to tell that the talented female actors are giving it their all to inject some fun into it. At the end of the day, Pitch Perfect 3 is wildly out of tune and may have put the Bellas out of the a cappella game for good whether they are finally moving on for real this time or not.